Trevithick and his innovations — despite their extraordinary number and breadth — had faded from public perception during the eleven years he spent in South America. However, he is now widely recognised for his engineering genius and as a pioneer of high pressure steam power. On his return to Cornwall in 1827, he found it difficult to rekindle the kind of recognition he had enjoyed during the early part of the 19th century. His lack of business acumen and his desire to get on with the next exciting idea rather than pursue the current one to a successful conclusion probably didn't help. However, without Trevithick, the advent of mechanically-powered road and rail travel may have been much later and would have taken a different form. His extraordinary efforts to harness 'strong steam' ensured that mines could be worked in dry conditions, and all kinds of previously-manual tasks could be carried out mechanically and more efficiently. "I have been branded with folly and madness for attempting what the world calls impossibilities, and even from the great engineer, the late Mr. James Watt, who said to an eminent scientific character still living [John Isaac Hawkins], that I deserved hanging for bringing into use the high-pressure engine. This so far has been my reward from the public; but should this be all, I shall be satisfied by the great secret pleasure and laudable pride that I feel in my own breast from having been the instrument of bringing forward and maturing new principles and new arrangements of boundless value to my country. However much I may be straitened in pecuniary circumstances, the great honour of being a useful subject can never be taken from me, which to me far exceeds riches." Michael Williams, Liberal MP for West Cornwall 1853-58, described Trevithick as "the greatest and worst-used man in the county". 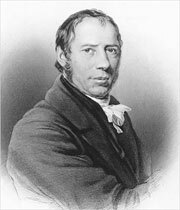 Williams was well qualified to offer his opinion, as he was from a mining family that controlled many of the Gwennap mines mentioned in the discussion of Trevithick's early career. He owned the Morfa copper smelting works in South Wales and was Sheriff of Glamorgan from 1839. He was also the Chairman of the Cornwall Railway Company and owner of Caerhayes Castle near St Austell, both from 1854. The most contemporaneous memoir of Trevithick, written by Henry Hyde Clarke in 1839, calls him "one of the neglected benefactors of the human race". To his son Francis, Trevithick was evidently a hero, and in 1872 Francis published a eulogistic biography of his father — without which Trevithick may have disappeared from history altogether. Had he lived longer, he would have seen Francis become a great railway engineer. Francis' most famous engine is the Cornwall built for the London & North Western Railway. 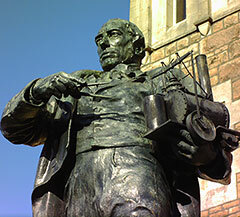 Trevithick's achievements are commemorated annually — on Trevithick Day in Camborne on the last Saturday of April, and in May in Dartford. Several academic awards bear his name, including the biennial Trevithick Scholarship founded at the Victoria University of Manchester in 1889, the annual ICE Trevithick Premium founded in 1900, and the annual Trevithick Memorial Scholarship established at Camborne School of Metalliferous Mining in 1923. However, his life was not to be memorialised at a national level until more than half a century after his death, when funds were raised for a memorial in Westminster Abbey. Even then, the proposed statue became a modest window, which was unveiled on 13th June 1888. It is next to the windows for Isambard Kingdom Brunel (1806-1859) and Robert Stephenson (1803-59). Since then, numerous local memorials to Trevithick have been erected. Some of them are listed below. 1897 ... The Institution of Civil Engineers commissions a marble bust of Trevithick from sculptor Charles Henry Mabey Snr (c.1836-1912). 9th March 1902 ... A tablet is installed in Dartford parish church, dedicated by William Walsh, bishop of Dover, paid for by J. & E. Hall. There is also a plaque in the former churchyard where Trevithick is buried (now St Edmund's Pleasance) that may be of the same date. 1904 ... A white marble bust of Trevithick is unveiled at Camborne library by Sir George John Smith. It was donated in 1903 by Cornish philanthropist John Passmore Edwards and sculpted by Henry Charles Fehr (1867-1940). 19th July 1919 ... A plaque is installed in Tehidy Road, Camborne, to commemorate the first trial run of Puffing Devil in December 1801. 17th May 1932 ... A statue is erected in Cross Street, Camborne, unveiled by HRH Prince George. The 2.3m gilded bronze statue is mounted on a plinth of Cornish granite and was sculpted by Leonard Stanford Merrifield (1880-1943) in 1928. 19th April 1934 ... A 2.25m high stone plinth is erected in Merthyr Tydfil, unveiled by David E. Roberts, and later topped with a model of the Penydarren locomotive sculpted by Howard Bowcott in 1992-3. 23rd April 1934 ... A tablet is installed in Gower Street (near the Catch-Me-Who-Can demonstration site) on the wall of the Engineering Laboratory of University College, London, unveiled by Major Oliver Stanley MP, then Minister of Transport. 16th October 1948 ... A stone plinth is erected outside the site of Trevithick's birthplace at 35 Station Road, Pool, unveiled by his great grandson Captain R.E. Trevithick. November 1949 ... A copper plaque is installed at Bridge Street in Bridgnorth commemorating Trevithick, John Urpeth Rastrick and the building of Catch-Me-Who-Can at the Hazeldine & Co foundry. 12th September 1953 ... A plaque is installed at Trevithick's home in Penponds, unveiled by his great grandson Captain R.E. Trevithick. 30th September 1978 ... A stone memorial is raised in Abercynon to commemorate the construction of the Penydarren locomotive. 21st February 2004 ... A wooden sculpture is erected in Abercynon, commissioned by Rhondda Cynon Taf Council to commemorate 200 years since the Penydarren locomotive ran. Also a mural at the Tesco supermarket in Merthyr Tydfil is unveiled by Trevithick Society Chairman Philip Hosken. 22nd March 2007 ... A blue plaque is mounted on the wall of the former Bull Inn (now the Royal Victoria & Bull Hotel) in High Street, Dartford, unveiled by Trevithick Society Chairman Philip Hosken. July 2008 ... A plaque is installed on the site of Hazeldine & Co foundry by Bridgnorth Civic Society to commemorate the building of Catch-Me-Who-Can. Detail of the gilded bronze statue by Leonard Stanford Merrifield that was created in 1928 and erected outside Cambourne library in 1932. IN COMMEMORATION OF THE ACHIEVEMENTS OF RICHARD TREVITHICK WHO HAVING CONSTRUCTED THE FIRST STEAM LOCOMOTIVE DID ON FEBRUARY 21ST 1804 SUCCESSFULLY HAUL 10 TONS OF IRON AND NUMEROUS PASSENGERS, ALONG A TRAMROAD, FROM MERTHYR TO THIS PRECINCT WHERE WAS SITUATED THE LOADING POINT OF THE GLAMORGAN CANAL. William FELTON's carriage works was close to this spot. In 1803 he built a carriage powered by a steam engine designed and supplied by Richard TREVITHICK, the great Cornish engineer. The carriage made several trips from here with up to about 8 passengers. In July of that year, one trip was made via Greys Inn Lane, Dorset Square and Tottenham Court Road to Paddington, returning the same day via Islington. This was the first self-powered vehicle to run in the streets of London and the world's first self-powered road people carrier. The London Steam Carriage heralded the age of the car. February 21, 1804 saw the first-ever journey of a steam locomotive, hauling a load on rails. Richard Trevithick successfully drove his engine and five wagons for five miles along the rail tramroad, from Penydarren to Navigation, Abercynon, with 70 men and 10 tons of iron on board. This display commemorates the finishing point of that historic journey. RICHARD TREVITHICK 1771-1833 Pioneering engineer and inventor of the world's first steam powered railway locomotive, lodged at this hotel from 1831-1833. He died here on 22 April 1833 after a short illness and is buried in the town. ON THIS SITE STOOD HAZLEDINE'S FOUNDRY WHERE IN 1808 WAS BUILT THE WORLD'S FIRST STEAM LOCOMOTIVE TO HAUL FEE-PAYING PASSENGERS. THIS ENGINE WAS DESIGNED BY RICHARD TREVITHICK, ENGINEERED BY JOHN RASTRICK AND BUILT BY THE FOUNDRY WORKERS OF BRIDGNORTH. THIS PLAQUE WAS ERECTED BY BRIDGNORTH CIVIC SOCIETY FUNDED MAINLY BY MEMBER MRS. CHRISTINA HOLDER AND ADDITIONALLY BY: BRIDGNORTH TOWN COUNCIL, BRIDGNORTH DISTRICT COUNCIL, BRIDGNORTH TOURIST ASSOCIATION IN JULY 2008.